The First Team PowerMount Aggressor mounts 12" from the wall making them a perfect solution for shooting stations and saving floor space. The PowerMount Aggressor Wall Mounted shooting station is designed to allow backboard installations in tight spaces where playing area is at a premium. 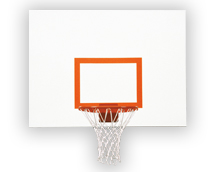 If your facility requires a backboard installation close to a wall, call on First Team PowerMount Wall Mount series! The PowerMount structure provides quick and easy installation of a basketball backboard on a wall with a minimal 12 inch of wall-to-backboard distance. The Powermount Aggressor comes with a rectangular shaped 42x60 Steel Backboard, mounting structure, heavy duty flex goal with nylon net. All PowerMount Wall Mount packages come with a manufacturers Limited Lifetime Warranty.